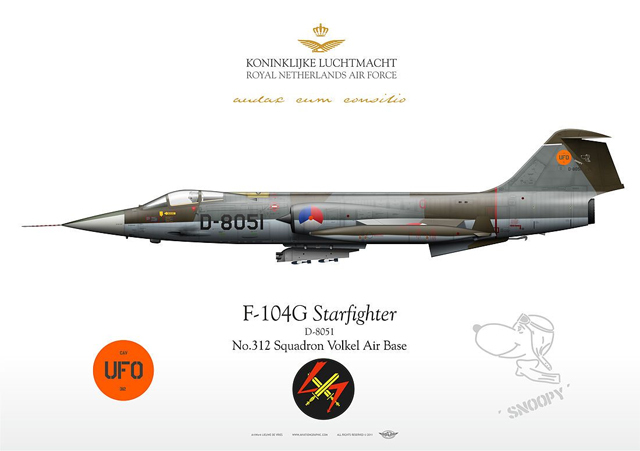 In the final years of RNLAF F-104 operations only two units still operated the F-104, 312 Squadron and the “Uitfaserings Onderdeel” or “Phase Out Unit” whose acronym in dutch was UFO. The badge was orange and either round or triangular in shape with the letters UFO in black. It became a normal practice for each crewchief to paint a “zap” on the machine he was responsible for. 8051 was zapped with a marking of the cartoon character Snoopy.